Enjoy all the conveniences of Ottawa Condo life minutes from Downtown – and with amazing nature right at your doorstep! Whether it’s sailing, jogging, kayaking, biking, hiking, tennis or just enjoying the beach, it’s all right here at this unique location in popular Britannia. View the Photo Gallery or Click here to watch the Video on Youtube. 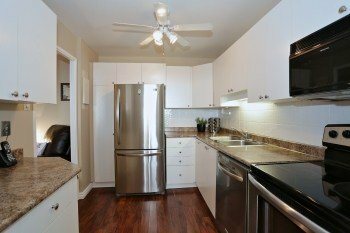 Beautifully Updated – Spread out in this spacious two bedroom condo with the convenience of an en-suite off of the large master and in-suite storage. Beautiful walnut hardwood floors have been recently installed making for stunning entertainment space. The hardwood continues through the bright and efficient kitchen, which features new stainless steel appliances plus lots of cupboards and counter space. Completely painted throughout – you can just move in and relax in this bright and airy condo. Enjoy your time after work on the balcony sipping a glass of wine and watching the sale boats at Britannia Bay and take in the amazing sunsets. Unbeatable Location – Truly a unique location in Ottawa, with easy access to downtown yet sitting on the edge of Nature. This condominium building sits adjacent to the Ottawa River Bike Path and Mud Lake, which is known to be one of the best bird watching conservation areas in Ontario. Add to that the nearby Britannia Beach, the Britannia Yacht club to park your sailboat or enjoy sailing lessons, or do some kayaking in the Deschenes Rapid on Lake Deschenes. Like to hike? The 4 kilometer trail around Mud Lake will start your morning on a high! Even better for canoe and kayak lovers, there are racks in the garage to accommodate easy storage. Whenever you feel the urge just grab your kayak and walk to the water! You’re right near the Deschenes Rapids! Even while you’re close to nature, you have easy access to shopping lots within walking distance including the new Farmboy and Rainbow Natural foods, malls within minutes and 70 miles of connected bike trails. Ride your bike downtown if you like. With a great walkscore from walkscore.com you can click and drag on the map below to see all the stuff you can find within walking distance in your new neighbourhood. Great Facilities – not only are you next to nature but even at home you’ll enjoy great facilities from the enormous salt-water indoor swimming pool to saunas, billiards, ping pong, exercise room, private tennis courts, and an expansive library if you want to exercise the mind as well. Everything is here to help you enjoy every minute of life and letting you be as active as you want! Call Eric Manherz today at 613-238-2801 for a private showing of this home! Click on the Property Details attachment below to view room sizes, condo fees, taxes etc. Play with the map below to see all the stuff you can walk to from your new home next to nature! Check out what Eric’s clients have to say! Thanks Eric for your great work, I can’t believe it sold that quickly! What can we expect from the Ottawa Real Estate Market in 2019? Why the kids next door are getting a better mortgage rate than more established individuals and Seniors? Which Ottawa Neighbourhoods have the highest or lowest crime rates?